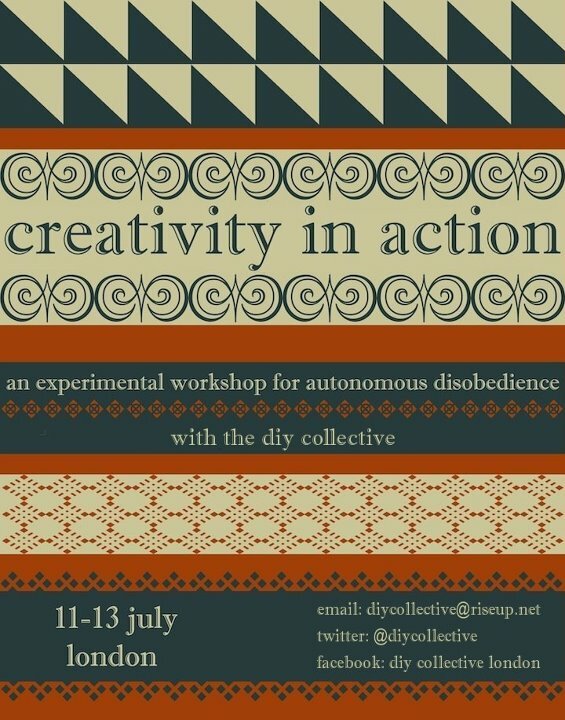 Creativity in Action is an experimental workshop hosted by the D.I.Y. Collective, Wednesday 11th July – Friday 13th July. Experiment with London – We’ll invent our own games and play with new forms. We will re-envision and transform London. Build affinity with each other – meet new and old friends, learn to work creatively together, and have fun in the process. Half workshop, half experiment, we will first get to know each other and learn about key elements of reclaiming space, taking action together and collaborative group work. The second part will be entirely group-led – we will work together to decide how and where we’d like to make a space (or spaces) in London autonomous. We’ll plan how to do it, gather resources, then do it together. We’ve no idea what we’ll come up with – only together can we imagine where we’ll end up and how we’ll end up there. Have you ever had that feeling at a demo, a protest or a direct action that the space around you, maybe a field, a road, a shop or a churchyard, has transformed into a truly public space, that it’s now your land, that it’s everyone’s land, that usually unseen societal pressures have been lifted – just for a moment? This workshop is for anyone who has felt that kind of beautiful connection before or wants to feel it for the first time. Maybe you spent time at one of the Occupy camps, maybe you were part of Climate Camp, UKUncut, or any one of the groups that form part of our history of reclaiming ourselves and the world we live in. Or maybe you see new potentials in existing spaces everywhere you look but don’t know how to get started. No previous experience is required, only a body, an imagination, and a willingness to share. The DIY collective have a background in reclaiming autonomous space and collaborative group work. We are artists and activists, wanderers and dreamers. Places are limited, so please book a place by emailing diycollective_AT_riseup.net and tell us why you want to come. The event itself is free. Food will cost £10 or £15. While the organisers of this event have no control over the legality of what the group will create, we will encourage the group to strongly consider the accessibility and consequences of taking illegal action. Each individual there will be encouraged to stay responsible for their own relationship with the law. There will be a thorough legal briefing.